I am primarily a printmaker but take my creativity wherever it leads and to whatever medium. I was first spellbound by the richness, texture and unique expressive power of the intaglio image when I encountered it during my foundation course in Yorkshire. Since then I have developed my own unique style of crafting the collagraph plate. Sometimes incorporating more elaborate plates in other art pieces. I spent years printmaking around my job as a graphic designer after graduating. Firstly printing at Kew studio in London then at the Bluecoat when I moved to the Wirral. Selling limited edition prints and doing commissions along the way. In 2017 I’m delighted to be printing in my new studio in West Kirby on my very own rolling press. An explosively creative and fabulous time in my life. Art is a cathartic process for me and definitely beats therapy. I constantly draw inspiration from imagery, people and materials around me…. mostly when I should be doing something else. The subject matter of my work is much like myself. 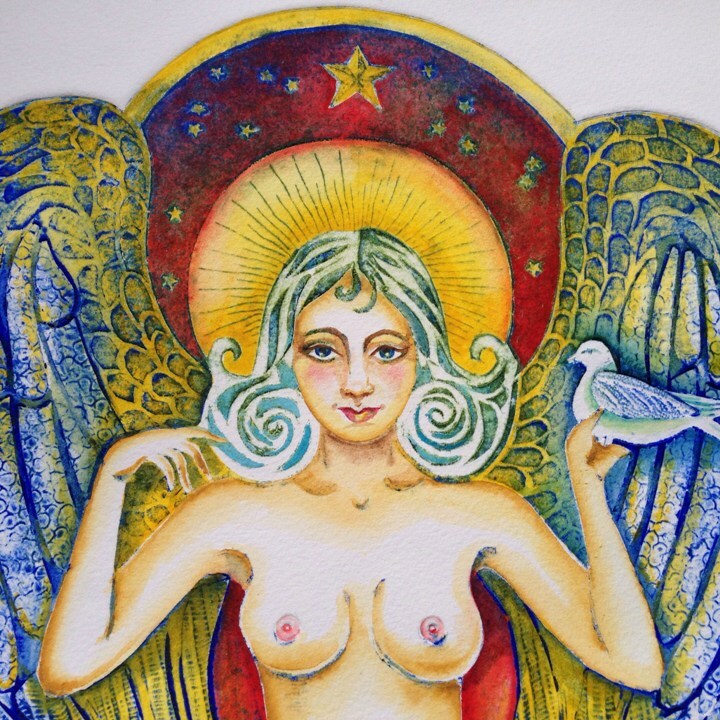 Multifaceted and sprinkled with humour, spirituality and feminine sexuality. I also love nature and the sea due to having my roots and early years in the beautiful, Celtic, Isle of Man.